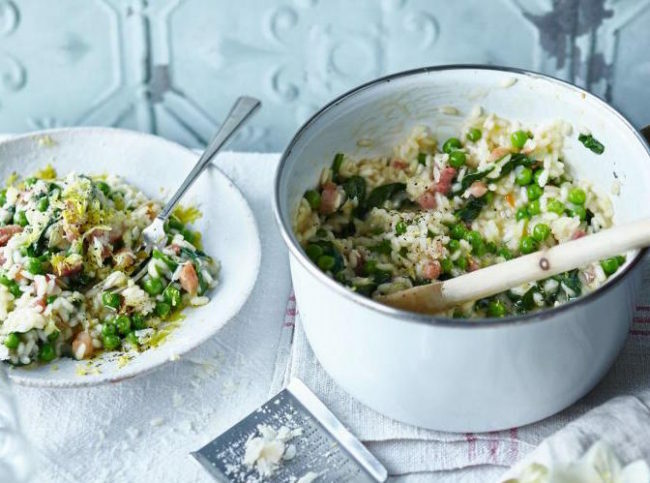 My seasonal Spring vegetable and pancetta risotto recipe (as featured in Sainsbury’s magazine) is simple to make and great for feeding a crowd – put the saucepan on the table next to a stack of bowls and a chunk of Parmesan for grating and let everyone dig in. Fry the pancetta in a heavy-based wide saucepan with 1 tablespoon of oil until nice and crispy, then remove with a draining spoon and leave to the side. Heat the rest of the olive oil in the saucepan and gently fry the onion and garlic. Stir occasionally until softened – about 10 minutes. Add the rice and allow the oil to coat it. Stir for 1 minute before adding in the wine. Allow to simmer and reduce for another minute. Now keep the heat to a simmer (one trick for a good risotto is to not let it boil at any point). Start slowly adding the stock ladle by ladle, allowing the rice to absorb the stock after each addition. This will take around 25-30 minutes. Once half the stock is in, add half the unsalted butter to the pan and stir it into the rice. Keep adding the stock and stirring gently until the risotto is creamy in appearance and the rice is al dente. You may not need to add all the stock. Once the rice is cooked, add the peas and pancetta and stir for another 5 minutes with a final ladle of stock. Take the pan off the heat and add the rest of the butter, the spinach and two-thirds of the Parmesan. Taste the risotto and season to taste. Serve in bowls and garnish with the lemon zest, some cracked black pepper and the rest of the Parmesan.